Temperatures rise, days are longer, and it is time for lighter reds. Grapes like Pinot Noir, Gamay and Cabernet Franc along with Lagrein, Zweigelt and Blaufränkisch, come to mind. These varietals produce great red wines enhanced by vivid acidity and bright red fruit flavors, which can be enjoyed room temperature or even slight chilled. Perfect for Summer. Over the next few months I will write different posts about wines made from these various grape varieties, but let’s begin with a juicy Pinot Noir from a traditional producer: Domaine Faiveley. Faiveley is located in famous Nuits-Saint-Georges, a small and “tranquille” commune about 16 kilometers north of Beaune, capital of the Côte de Nuits region, where one can find some of the most exquisite (and expensive) red Burgundy wines (Vosne-Romanée, Vougeot, Gevrey-Chambertin, Chambolle-Musigny, Morey-St-Denis, etc…). Founded in 1825 by Pierre Faiveley, Domaine Faiveley (also known recently as Bourgognes Faiveley) has been handed down for many generations from father to son for over 175 years. Francois Faiveley, the sixth generation, now runs with the same passion, competence and enthusiasm, the largest family owned Domaine in Burgundy. Dedicating the major part of their resources to buying vineyards on the best slopes (Côte), they gradually and methodically restructured vineyards fractured by French inheritance laws (which dates from Napoleon III and still apply to this day, Burgundian are attached to their traditions). As of today, Bourgognes Faiveley owns more vineyards and appellations in their entirety (known as “monopoles”, meaning full vineyard under one name or one appellation with no fragmented parcels or multiple ownerships) than any other domaine in Burgundy. The Domaine owns approximately 120 hectares of vines under production. Son of founder Pierre Faiveley. Joseph developed the wine business his father had founded by expanding his wine markets. An enthusiastic traveler, he journeyed extensively throughout Europe to promote the quality of his wines. Joseph initiated a policy that his descendants continued and refined to an art: purchasing vineyards situated in the best appellations and terroirs. Vine selection is mainly based on quality, not on quantity. Vineyards management includes depending on the needs of the vintage, vigorous pruning, green harvesting, de-leafing and appropriate reduction of the yield to increase quality and maximize concentration. All grapes are hand-harvested and carefully sorted in the vineyards and on the sorting tables on arrival at the winery. The wines are matured in partly new oak barrels. Depending on the wine and the desired final profile of the wine, the amount of new barrels varies and is adapted to the need of the wine to avoid excess of wood flavors and preserve its natural aromatic complexity. Filtration is kept to a minimum, and many Premiers Crus and Grands Crus are bottled from the barrel without filtration to emphasize the uniqueness and the character of their terroir of origin. As a Sommelier and Wine Buyer, I had (and still have) the chance to taste, select and sell many Faiveley’s wines in numerous high-end restaurants and boutique retails in Paris, London and New York. 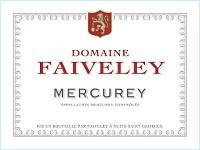 However, Faiveley’s portfolio encompasses an astonishing number of Cuvées and wines for a Burgundian Domaine. Out of the approximately 120 hectares of vineyards, more than 57 different wines from the most prominent appellations in Burgundy are crafted under the name of Domaine Faiveley: 27 in the Côte de Nuits, 15 in the Côte de Beaune and 15 in the Côte Chalonnaise, and few more. It is a huge portfolio full of standards and classics Burgundy wines. Yet, it seems that one of my favorites and surely one of the most consistent wines from Faiveley’s portfolio that I had to taste (many times), except of course for most of its prestigious Grands Crus and Premiers Crus from the Côte de Nuits, is its: Mercurey Rouge 1er Cru Monopole “Clos des Myglands”. I don’t know why but I’ve always loved this wine, and the last few vintages that I have tasted are now exception to the rule. Its Mercurey village is a nicely crafted wine too, especially for the price. This light and vivid Pinot Noir was aged 12-14 months in partially new oak barrels. It has a bright, red ruby color of medium to light intensity, quite see through. The nose is delicate, elegant, somewhat a bit restraint yet fresh and earthy with red berries and cherry aromas. The palate offers freshly crushed spicy, ripe red cherry and raspberry flavors. Medium-bodied, its soft yet crispy red fruits expand on the mid-palate, enhanced by refreshing acidity and supported by silky tannins into a lengthy finish that ends with good, tart red fruit. Enjoyable now and ideal for hot weather, especially if served cool, it will be delicious with charcuterie or lean grilled meats.